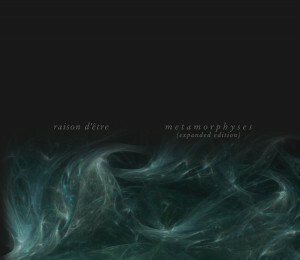 Being the seventh full length album from Raison D’etre, Metamorphyses is in many aspects different from previous works by Peter Andersson. The organic flow and the use of drones has been extended, creating a varied output of both calm/meditative and harsh/intense sound structures. The transformation in sound is also present in the perceived emotions. Demanding, tempting and deceptive are only a few elements that characterize the ordeal the listener has to withstand. The expanded double CD edition of Metamorphyses contains the original album remastered according to the K-14 level standard. Additionally, 2 previously unreleased early sketches from the Metamorphyses session have been added to the first disc. The second disc contains a selection of previously unreleased live recordings from performances made between 2006-2008 in Sofia, Gent, Salzburg, Alkmaar and Budapest. In 6-panel digipak with original art by Kati Astraeir.